Inder Loves Folk Art: One last 2015 make and a year-end review. Happy New Year! We are on the third week of a really cold snap in Oakland. As you know, I live in a Victorian house (built 1896) that lacks both insulation and central heating (we have a gas fireplace unit that is the sole source of heat for the front of the house and upstairs), so while it rarely drops below freezing in Oakland, our house is often just a few degrees warmer than outside. We've been bundling up in sweaters, warm socks, slippers, blankets, and hats around the house. This seemed like an opportune time for some post-Christmas selfish sewing, so I made myself some Hudson Pants by True Bias patterns for lounging around the house. This pattern has taken the internet sewing community by storm, and I can see why!!! A very easy and fast sew, and these make for some really comfortable sweatpants. 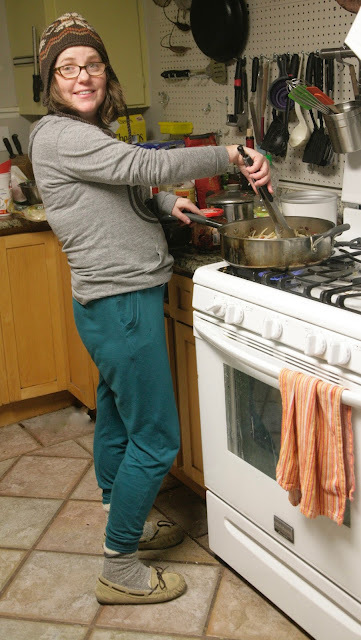 Here I am enjoying my new loungers while whipping up some fried rice for the family! No fancy photoshoot here, just real life! I made a couple changes, mostly due to the supplies I had on hand. I didn't have any appropriate drawstring cord, so I skipped the drawstring. I didn't have any 2" elastic, so I ran 1" elastic through two channels instead. As a result of that change, the waistband isn't quite as firm as I'd like, and it wants to roll a bit, but they're plenty wearable. After making these, I picked up some wide elastic and cording at Britex for my next pair (they have an amazing selection of colors!). The fabric is a drapey bamboo french terry I bought at Stonemountain. It's a little lightweight for this pattern, and for our freezing cold winter, but it's super soft and comfortable. I used the same fabric for the pocket detail and cuffs. I've already bought fabric for my next pair, a thicker cotton french terry. I spend a lot of time in my loungewear, but until now I've generally worn the same old ratty items. I've decided it's time to retire some of my ugly old pajamas and replace them with nice me-mades. Again, all real life over here! Messy house, half drunk bottle of beer behind me! The good thing about this weather is we barely need to refrigerate our beer, it stays nice and chilly at "room temperature." When we replaced our windows a couple years back, I remember they opened up the wall behind me in this picture, and besides there being no insulation, it was just dry wall nailed on top of lathe and plaster, and the plaster had partially fallen or worn out, leaving gaps where you could see daylight shining through the walls. I knew our walls were crap, but the visual was pretty striking! I get the feeling that when people started building in Oakland (and Northern California in general), the idea was to create temporary shelter for gold miners, railroad employees, and speculators - no one expected to stay for long or actually live in these houses! Either that or they built their houses in September, before they had experienced an El Niño or a foggy summer. 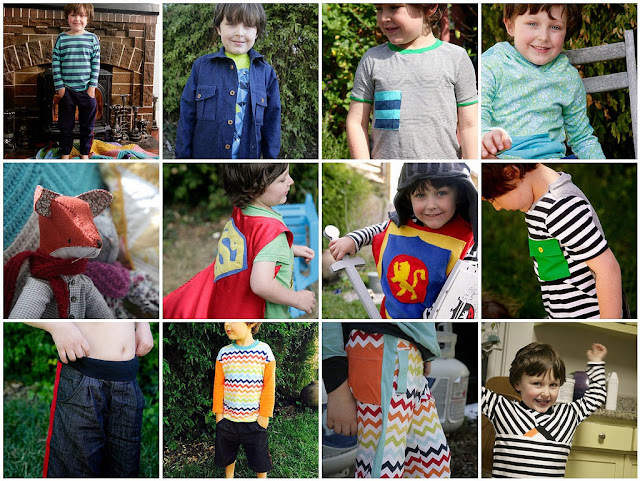 2015 had its definite ups and downs for us, but sewing was a constant. I sewed a lot this year! My blogging was less consistent, and I struggled to keep this blog up at times this year. For that reason, quite a few items went unblogged. There were a couple of reasons for this struggle, I think. I was really busy this year with work and kids, and I often just didn't feel like I had time to write a whole blog post. Instagram provided a quicker way to share my makes, and sometimes I just didn't feel like writing a long post after sharing there. 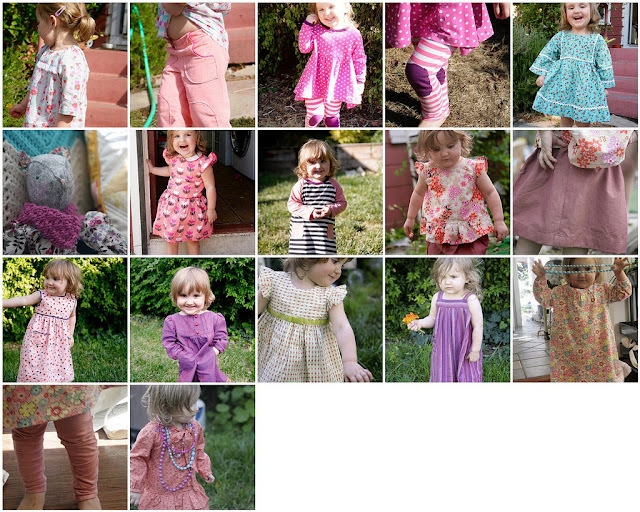 I regret not blogging more of my makes, though, because this blog provides a great record of my sewing and my life that Instagram really can't replace. We'll see how this year goes as far as blogging. So anyway, here's the year-end review! First up, sewing for Joe. Not pictured: two more pairs of shorts and a couple of t-shirts. Total of about 16 items. 2015 was a year of shorts and t-shirts for Joe, plus a couple of dress-up/costume items and a cute little fox. Not a lot of fancy sewing for Joe this year - that flannel button-down was the most complicated item, but lots of fun instant gratification projects! Joe wears mama-made shirts or shorts (and now pants! yay!) on a frequent basis. He helped me choose some of the styles and fabrics too. I see more t-shirts and simple clothes in fun fabrics in the coming year. My most used patterns for Joe were the Sketchbook Shirt and Shorts, a simple boxy Ottobre t-shirt (1/2015 #11), and the Flashback Skinny Tee (again). Not shown: One boring pink knit dress and a pink supergirl cape. Total: 19 items. Maggie made out really well this year! She's a more appreciative audience for handmades, so it's no surprise she gets a few more items than her brother. As long as it's pink (with a few exceptions), she's bound to like it. Her favorite items are definitely the Geranium dresses and her pink Hanami. The Geranium was the only repeat pattern this year, it's a good one! Maggie also got a little kitty cat. This was definitely a banner year for sewing for myself. I was super inspired by Me-Made-May earlier in the year and I'm looking forward to participating again in 2016. My most worn items are my Hemlock tees and Linden sweatshirts. I also love my Mabel skirts - secret PJ office wear! This year, I need to make more t-shirts and simple woven blouses, I wear mine all the time! 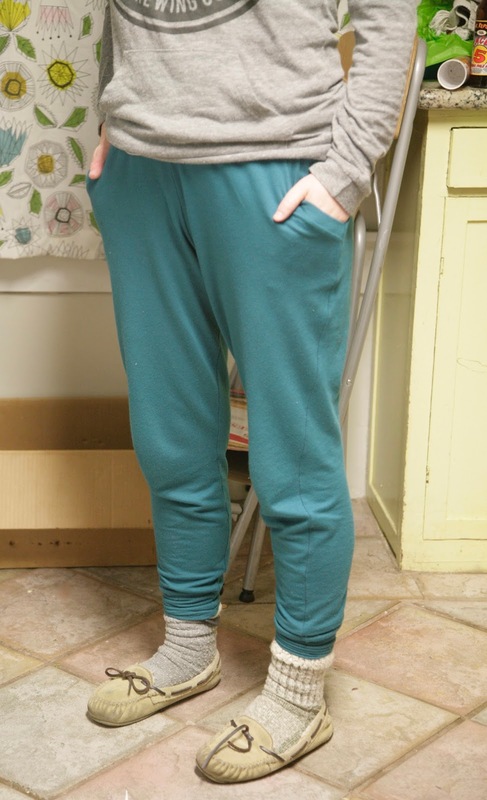 I also want to make more loungewear and try some woven Hudsons. Not shown: Three gift garments for nieces and friends' kids, felt Christmas ornaments, a stuffed robot for the niece. Total items: At least 17. This year I knocked out two quilts, made some bags, stockings for the guys, shorts for Steve, and some other random gifts. Not too shabby! I often wish I had more time to make gifts for my family and friends, and I feel like the majority of my sewing is "selfish" - for me or my kids. But considering everything above was a gift except one big quilt, that's really not too bad! I have limited time, and really feel the need to reduce "obligation sewing" and sew gifts only when I feel especially inspired and excited about them. 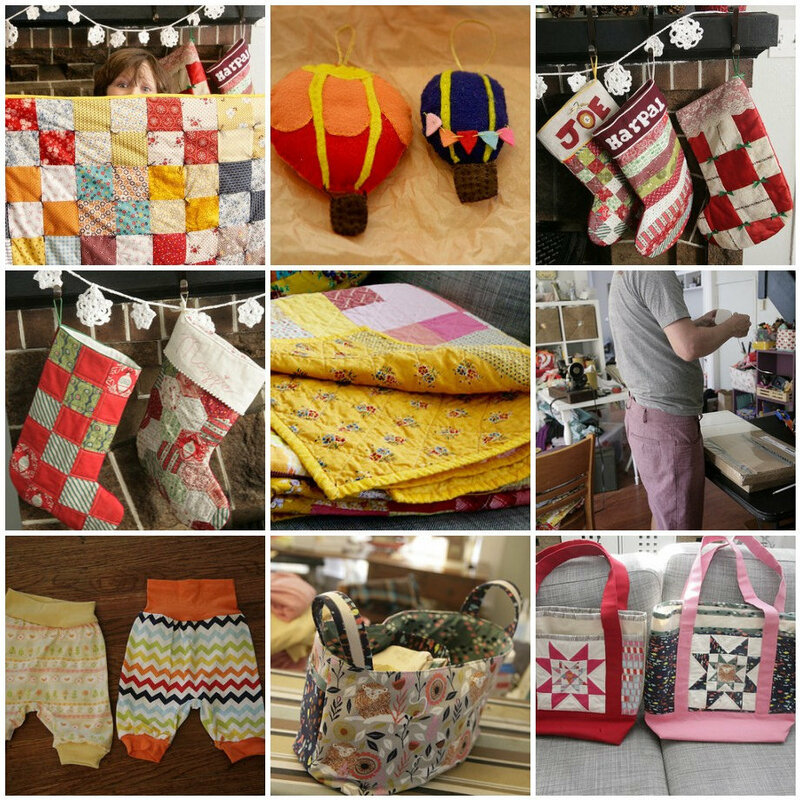 Most of the gifts I sewed in 2015 were really fun and enjoyable to make, and that's the key! Holy &%^#!!! That's SEVENTY ITEMS I made this year! YOU GUYS! That is (incredibly) approximately 1.3 items a week! 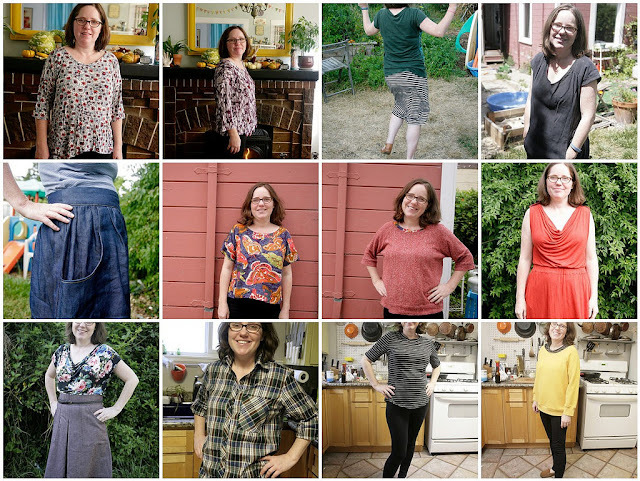 Granted, many of those items (baby pants, leggings, and t-shirts) were really easy and fast sews, but quite a few of them (button down shirts, shorts for Steve, and quilts) were time-consuming makes. You want to know what's funny? When I started thinking about writing this post, I didn't feel like it was a particularly great year for sewing. It just goes to show - it all becomes a blur after a little while, and I tend to forget about a lot of my projects. So wow. I'm actually kind of speechless right now! I had no idea I had sewn quite so many things! It will be fun to see what 2016 brings! I'm not even going to pretend that "sewing down my stash" is a goal this year. Why kid myself, right? Just goes to show that a year end review is totally worth it! Very impressed by how much you sew - especially for other people. I'm WAY more selfish than that. ;-) Love your Hudson pants - what a great color. I totally live in mine (and am so glad they still fit at 6 mos pregnant). Happy new year! What a great year Inder. I agree that knit and woven tops for us are the winners. Sewing down your stash doesn't mean that you can't add to the top of the pile, does it? I'm in if you're game to try! This was a great wrap up, Inder! You were very busy sewing this year-- along with all the other things you had going on. As a regular reader of your blog I can say I never felt like you were missing from here for long. I know that even the simplest of posts can take a while to get publishable. Maintaining a blog is a lot of work in itself so I am going to try to cut myself some slack this year as far as blog post regularity goes. Happy New Year! I loved this post. Congrats! Excellent year. And you said I was prolific! You are a rock star! That is really so very amazing! Sometimes it sneaks up on you - I get it. The year Hazel was born, I made 70 something garments I think. And I was like - what the??? Didn't seem like nearly that much at the time! Also I hear you on the IG thing. To me, it just does not take the place of blogging. I like the personal record, and I do love pictures. Lots of pictures (ha - but true!). Still, there have been some things I have not blogged and I wished I would have. Wow - I have never added up all my makes from a year. That is seriously impressive! And such a great mix of stuff. I love your comment about the cold weather at least keeping your beer at the right temperature. Priorities! Your hudsons look so cozy! I love the real life photo shoot, hehe. I'm amazed at all the things you made last year! You were prolific! I'm impressed. I love your hudsons. They look way comfy. I didn't blog as much this past year. I probably only blogged about half of the things I made. I go back and forth about whether I want to continue blogging, but ultimately I do. I enjoy the record of things and also the community. Happy 2016! Hehe you're cracking me up with your indoor layering. That's so crazy about your house's lack of weatherproofing!! BTW I think I wear my "loungewear" sewing has gotten more use than anything else I've made...Hudson Pants especially. Thumbs up. Jed will not belive me about your house, we need pictures the next time you are doing some work. That is a lot of sewing considering you work as well. Have you heard of Emu boots? Leather and sheep skin lined, nice and warm. Holy cow! You really did sew A LOT this year!! You totally knocked it out of the park! I love seeing how big and grown up Joe looks nowadays! And, Maggie and that infectious smile is always a treat to see in her mama mades! Instagram does totally make the blogging feel like so much work sometimes doesn't it?! There's all that writing and editing and stuff ;) I myself had the same difficulty/problem! I still can't believe that I haven't sewn myself of hudsons... must get on that! Congrats to an amazing year (as usual) of sewing! What a lovely, varied, colorful year of sewing! And so many wonderful stories with each item you made. Also, you've got me very tempted to make some hudson pants for myself. They look so soft and comfy! O loves his mini pair.